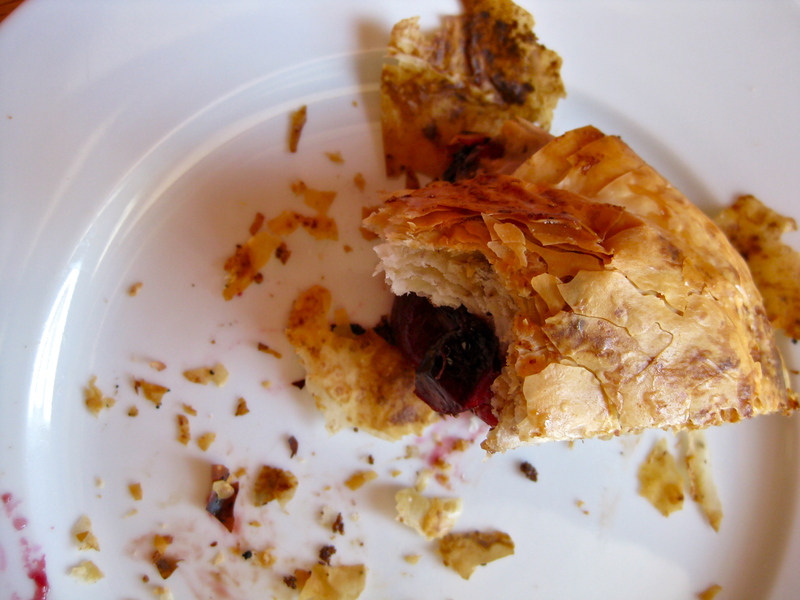 Do you enjoy seemingly infinite layers of shatteringly crisp phyllo? 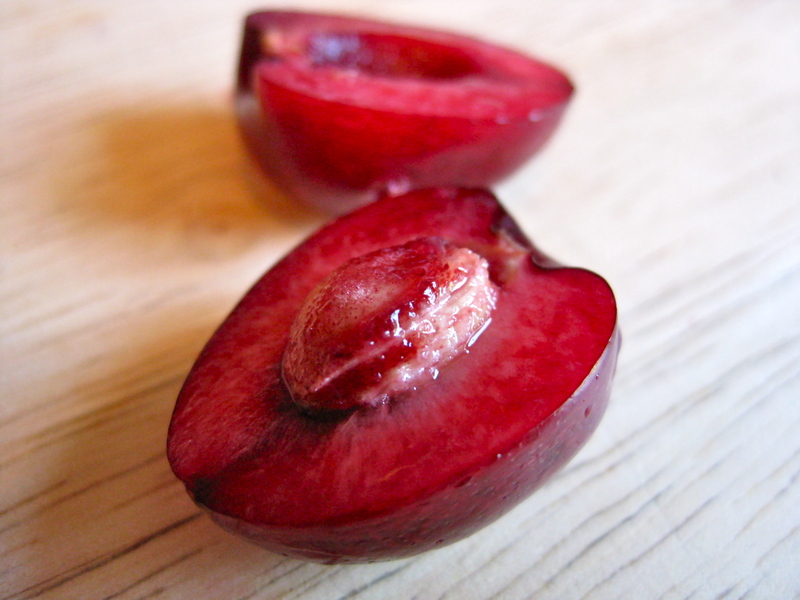 What are your feelings concerning rich, dark cherries? How about a dash of almond in each bite playing off of the lingering almond scent of cherry pits? You approve? Great! You want to make this. But then there’s the other side of the equation. 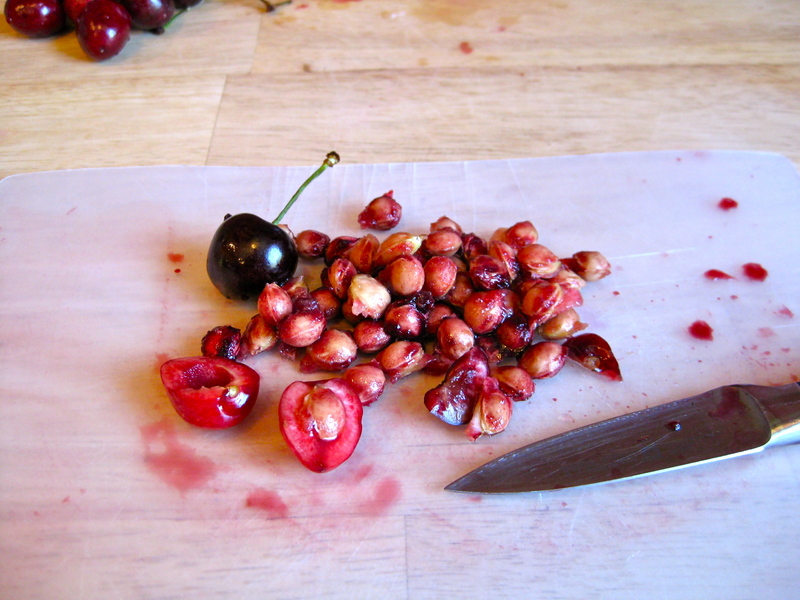 Pitting a pound and a half of cherries. Layering each sheet of phyllo, brushing it with butter, and then sprinkling it with a dusting of ground almonds and spices. Repeating that process many, many times. Maybe you don’t want to make this. But, wait! You do! I know this strudel might look like something only a person who is really into self punishment might attempt, but I swear to you that, start to finish, it’s really not all that time consuming or difficult. Yes, I pitted a pound and a half of cherries by cutting each cherry in half and removing the pit by hand, one by one, but the entire operation only took me, start to finish, fifteen minutes. And, true, layering the sheets of phyllo and then brushing and sprinkling each one can seem like a monumental task, but, in reality, it’s not the type of activity that one needs a graduate degree in Food Science to complete. Again, it’s a process that will take you fifteen minutes, tops, and you certainly won’t be any worse off having taken a stab at it. In fact, at the risk of sounding like a complete loon, I actually enjoy the process of methodically layering phyllo. Perhaps it is the repetitive nature of a rather short task that produces immediately, visible results, but I find the motions rather soothing. But forget all of that. Whether or not you fear the task of making this strudel, I can assure you of one sure thing: you will definitely, without a doubt, immensely enjoy eating this strudel. Again, flakey layers of crisp phyllo. 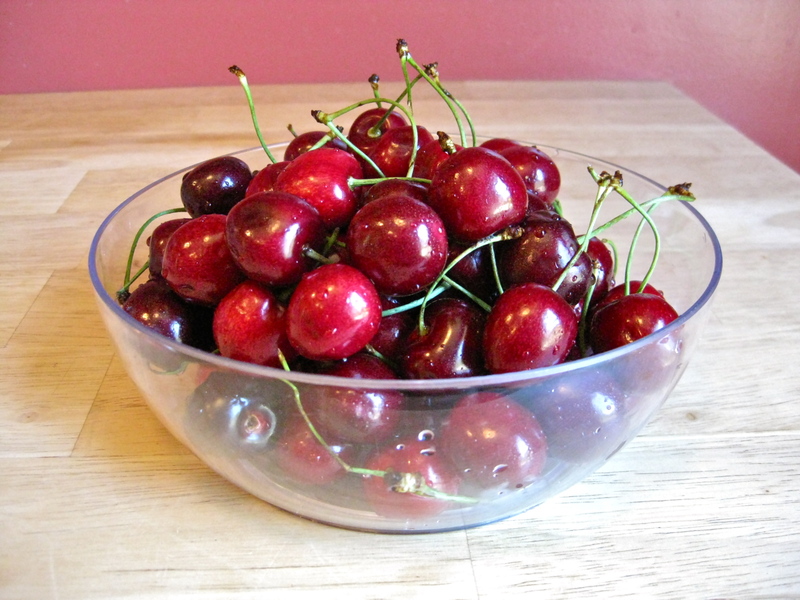 Plump and perfect cherries. Sweet, syrupy juice mingling with a hint of almond. No, really. You want to make this. In a large bowl, combine ¼ cup dark brown sugar, pitted cherries, tapioca, lemon juice, almond extract, and pinch of salt. Toss to combine thoroughly, then set aside. 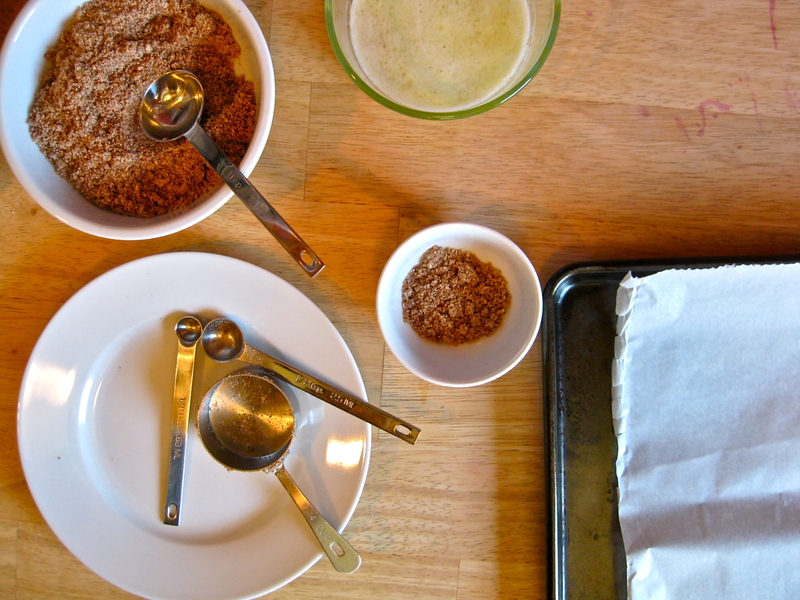 In a small bowl, combine ground almonds, cinnamon, and remaining ¼ cup dark brown sugar. Reserve 1 tablespoon of mixture and set aside. Cover unrolled phyllo stack with a lightly dampened kitchen towel (this will keep the phyllo from drying out as you work). Take two phyllo sheets from stack and lay them down on your parchment-lined baking sheet with a long side nearest you (keeping remaining sheets covered as you work) and brush lightly with butter. 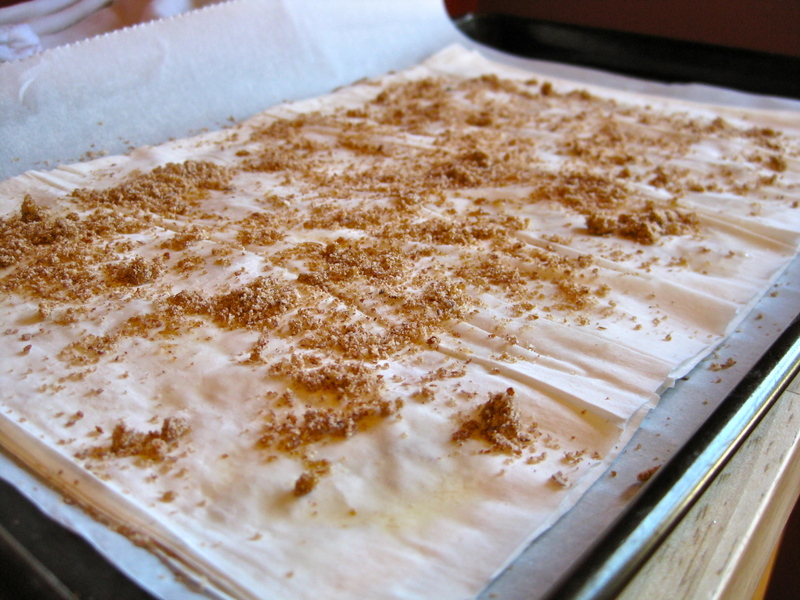 Evenly sprinkle surface of buttered phyllo with a heaping tablespoon of ground almond mixture. 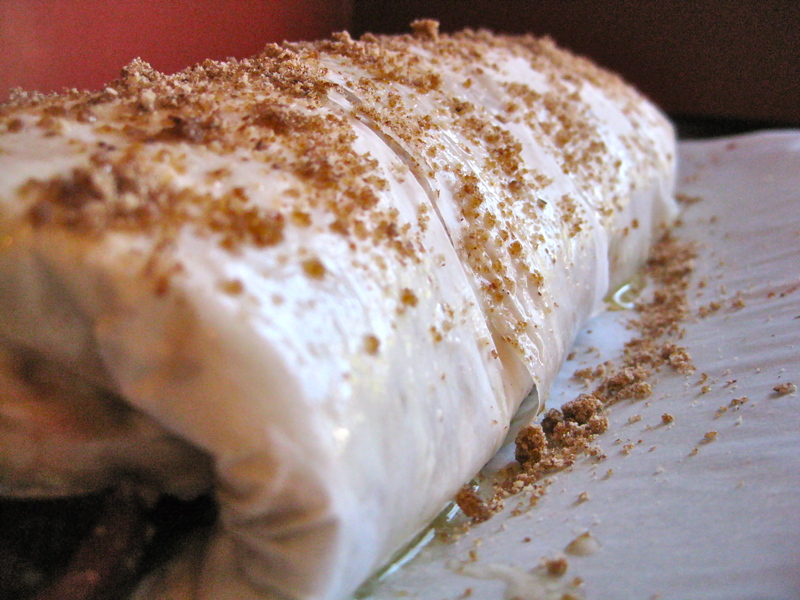 Continue layering, buttering, and sprinkling in this fashion until all of the phyllo sheets have been used. The number of layers you will have will depend largely on the size of your phyllo sheets. 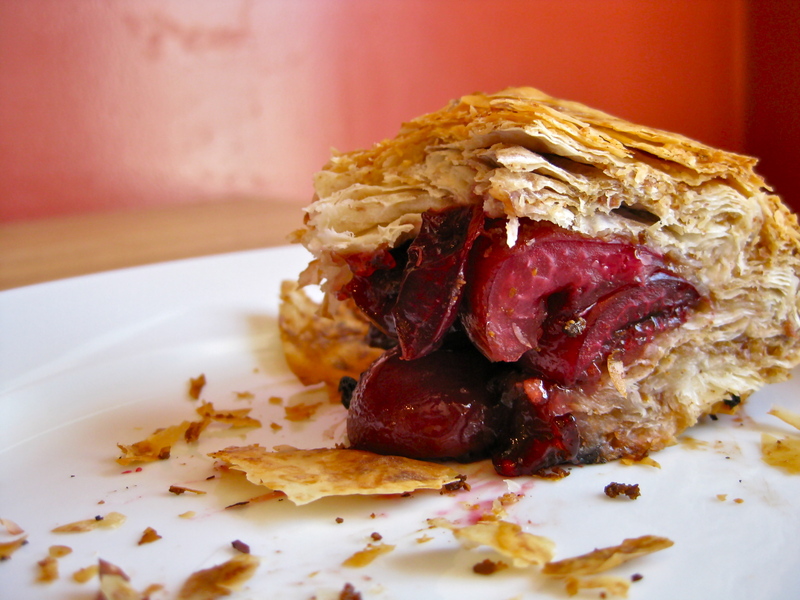 When all of the phyllo has been layered and prepared, spoon the cherry mixture on top of the phyllo stack, doing your best to arrange most of the cherries on the long half of the phyllo that is closest to you. 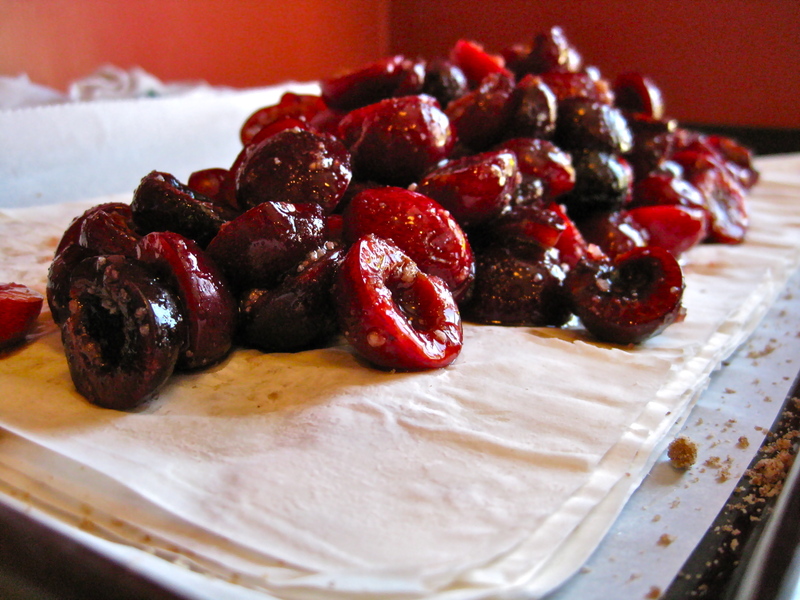 Carefully roll the cherry-topped phyllo sheets into a large log, tucking in the short ends as you go. Arrange the roll seam side down. Brush the top of the strudel with the last drops of melted butter, then sprinkle with reserved tablespoon of almond mixture. Using a sharp knife, cut two or three steam vents along the top of the strudel. Bake strudel in center rack of oven for 30-40 minutes, until cherry mixture is bubbling and the strudel is a deep golden brown. Cool strudel on baking sheet for at least 30 minutes before attempting to cut and serve.